On 11 November 2018, tens of thousands of people gathered on selected beaches across the UK to say goodbye and thank you, to the millions of men and women who left their shores during the war, many never to return. Pages of the Sea was commissioned by 14-18 NOW to mark the centenary of Armistice Day. It is the culmination of the five-year programme of arts commissions marking the First World War centenary. The nationwide public art project was curated by Oscar-winning filmmaker Danny Boyle. The Calouste Gulbenkian Foundation (UK Branch) supported the project as part of our Participatory Performing Arts strand. Pages of the Sea highlights an approach to national public engagement, everyday encounters with the arts, and mass participation that connects people with each other and the past. 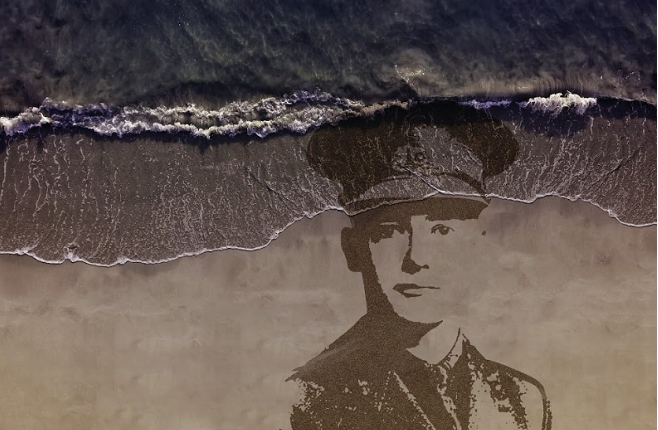 On 32 beaches, over the course of several hours, a portrait of an individual from the First World War emerged from the sand, designed by sand artists Sand In Your Eye. With the rising of the tide, the portraits were washed away as communities took a moment to say a collective goodbye. The public were also asked to join in by creating silhouettes of people in the sand, remembering the millions of lives lost or changed forever by the conflict. Portraits included Dr Elsie Inglis, suffragist and founder of the Scottish Women’s Hospitals, war poet Lieutenant Wilfred Owen, and Second Lieutenant Walter Tull, the first ever black officer to command white troops. Poet Carol Ann Duffy wrote a poem The Wound in Time, especially for Pages of the Sea, which was read by individuals, families and communities on the day. 14-18 NOW has been working with regional partners to deliver workshops and events across the country in the lead up to Armistice. You can find out more about the people and stories of the First World War in your area and browse the images of some who left their shores on the Pages of the Sea website. You can also add portraits of family or community members who contributed to the First World War effort. Pages of the Sea is commissioned by 14-18 NOW. It is delivered with partner organisations across the UK. It was supported by The National Lottery through the Heritage Lottery Fund, Arts Council England and Big Lottery Fund, and the DCMS. With additional support from Backstage Trust, Bloomberg Philanthropies, Calouste Gulbenkian Foundation (UK Branch) and National Rail.